If you've ever wondered what heaven looked like, combine Santorini with Lake Como and I'd say you'd be pretty spot on. I love pretty much every place I travel, each for different reasons, but it's rare that a place takes my breath away the way that Lake Como did. Its beauty, its splendor, its serenity...there really are no words. Luckily, what I can't seem to find the words for, I can make up for in the ridiculous amount of photos we took (none of which, sadly, include George Clooney or his house). Keep scrolling to see all the magical details of this place, plus tips on what to wear/pack, where to stay, what to eat and what to do, especially if you're traveling to Lake Como in the off season. In the summer time, I picture floating around the lake in ethereal white gowns or wearing lots of linen and stripes. However, in the fall, when we visited, sweaters are key. In fact, I wish I had had more with me when we were there. Other things I wish I had packed- gloves, a hat, a scarf and a heavier jacket. It ended up being quite rainy, and when it wasn't rainy, it was misty/foggy for much of our visit. It only enhanced the beauty of the lake, but it did nothing for the lack of layers we had brought. That being said, you can check out our his & hers dinner outfits and my cozy look to get some ideas. 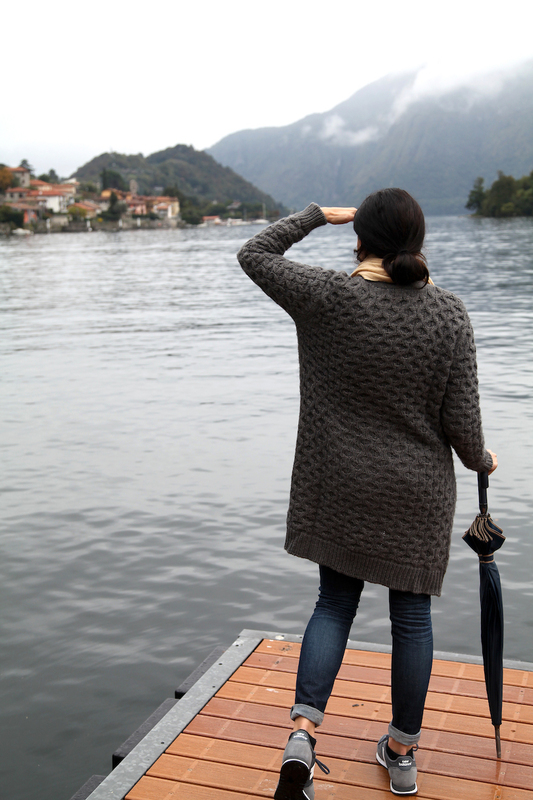 As a general rule of thumb, much of what we did seemed to require not much more than business casual, which could have had to do with the places we went, the fact that it was off season or just the rule of thumb for the Lake Como region. Also, don't forget workout gear/tennis shoes....there's an incredible hike around the lake that you MUST do (more below)! Because of the lake, much of what you'll find on the menu revolves around "lake fish", be it dried, made into paté, breaded, crusted or served in a sauce. It's very delicious and mild so even if you aren't a big seafood person, you should still try this local favorite at least once. For breakfast/lunch/snacks, we ate at our Airbnb or packed things for while we were out and about. This consisted of items like fruit, toast, cookies, meat, and cheese, all things that could be bought in the local bakery or one of the little shops. Albergo Plinio- We unknowingly trekked what seemed like halfway around the island on the narrowest of roads in the dark of night to get here (in our defense, we were told the path was lighted and the walk was 20 minutes). After about an hour of walking, we arrived to what we thought was a closed restaurant. Turns out we just made it before they locked the door and right in time to snag the only available table in the packed restaurant. The food was absolutely amazing, which is a good thing because I'd hate to know how many times I came near death for subpar food. I got the tortellini, which were huge and divine, and the Mr. got the mushroom risotto, which was beyond delicious. Ristorante La Comacina (located right below our apartment in Sala Comacina)- They serve both lunch and dinner, but we only dined here for dinner. We ordered the bresaola with local cheese, gnocchi with mushrooms, and fillet of lake fish in olive crust, and for dessert, the special apple pie and green apple sorbet with calvados. The fish was incredible and so was the gnocchi, which, by the way, would have been enough for at least 3 people. We gladly would have eaten multiple meals here...it was superb! Locanda Dell'Isola Comacina- To be clear, we didn't actually eat here, though we did think about it. However, I'm including it in the list because it's a unique spot that has served the same menu since it opened. It's a favorite among celebrities, particularly George Clooney. Le Tout Paris (a wine bar that also has pastries and coffee in the morning). There's also a panificio (aka bakery) on the main street and there's a spot (with no name, but it does have a Caffé Milani sign outside, as seen in one of the photos below) tucked away in between the homes that sells wine and liquor and also functions as a bar. We stayed in the small, quaint town of Sala Comacina in an Airbnb. The apartment itself was a bit older, but when you see the view, you won't even care. It overlooks the lake, oh yeah and George's favorite Como restaurant that I mentioned above (#nobigdeal). Not to mention the most adorable old lady owns the place. She came to meet us at the bus stop so that we wouldn't get lost, she left us wine, meat, cheese, crackers, bread, desserts, wine and lemons from the tree growing on her balcony, and she pleasantly conversed with us throughout our stay. It's also located right above La Ristorante Comacina (one of the places we went for dinner that I mentioned above), meaning the commute to and from dinner was quite possibly the easiest I've ever had. If you're visiting in the summertime, the beach is conveniently just a few steps away. And on Tuesdays, a truck full of local fruit and vegetables pulls up right out in the alley and sets up shop for the day. Even if you don't want to buy anything, it's fun to see the locals come and buy their goods, and each time we walked past every single person said "Ciao!" Green Way del Lario Walk- I can't recommend this enough. 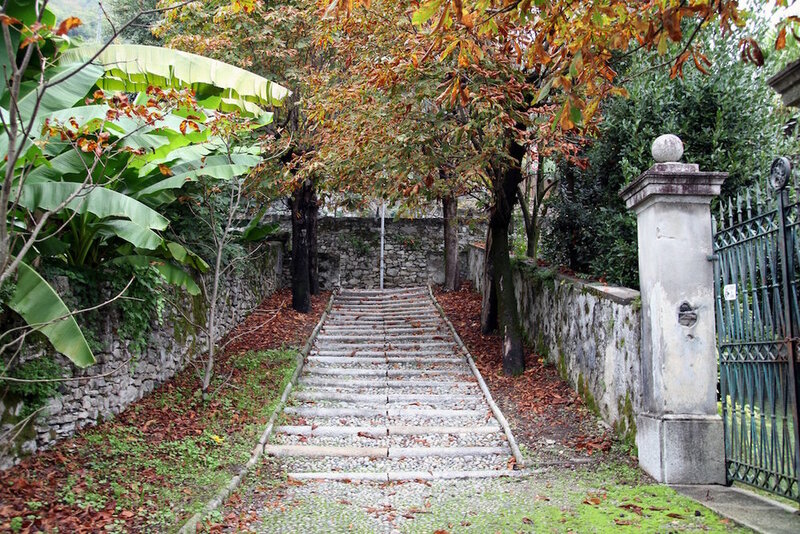 The beautiful path (which follows the old connection road built by the Romans) weaves in and out of the hills surrounding the area, giving you a comprehensive view of different houses, towns, old churches,and, obviously, the lake. It's a lengthy, but easy, pathway (we covered about half of it), but if you only have time to do one thing in Como, do this. Read/Draw/Write- If there was ever a time to just sit and enjoy a peaceful hobby, this is it. Nothing like some gorgeous views to help you paint a beautiful photo. Visit Bellagio- Certainly the most popular spot at the lake (there are even day trips here directly from Milan). While it was on our list to do (the ferry stop for it was conveniently located right below where we stayed), we opted to instead explore our small town as we wanted something a bit less touristy. However, if shopping and a variety of restaurants is your goal, definitely check this spot out. Ride One of the Cableways- We really wanted to do one of these, but because of the weather we decided to skip. However, I'm sure, without even having been on one, that it's an incredible experience. If you're looking for a quiet, quaint, relaxing, cozy, romantic getaway, I definitely recommend visiting Lake Como, specifically Sala Comacina, in the off season. While the smaller towns will have less in the way of restaurants or stores, they'll have a much more "local" feel to them. The one downside to this was having to trek around a bit to find food (minus the items our host left us and the time we ate at the restaurant down below). If you had a car, it wouldn't be much of an issue, but traveling around on foot can make it a bit difficult so I definitely suggest keeping transportation/town size/food options in mind when picking a town to stay in. The best way to get to Lake Como is to fly into Milan, then take the train north (it's about a 45 minute ride). From there you'll hop on the bus to your destined town. Make sure to sit on the left side of the bus for the best views, but don't get too distracted. You'll have to ring the bell for your stop so the driver knows to let you off, and trust me when I say, the stops can come out of nowhere/be in the most random of spots. Buy your return bus tickets anywhere but on the bus, as they'll charge you more. Buy them before you leave the station, buy them from the local stores in town, or, like us, you can probably buy them at your hotel/wherever you're staying.